The 56th annual Distinguished Young Woman (DYW) of Hawaii scholarship program finals took place on Sunday, February 8th at Sacred Hearts Academy. Major sponsors of the program include Hawaii Pacific University, Nan Inc, Hawaiian Electric and Sacred Hearts Academy. Megan Garcia, a Sacred Hearts Academy senior and the daughter of Bert and Melochi Garcia, was the 3rd runner-up and the recipient of a $1,500 cash scholarship and a $12,500 tuition scholarship from Hawaii Pacific University. Post by Distinguished Young Women of Hawaii. 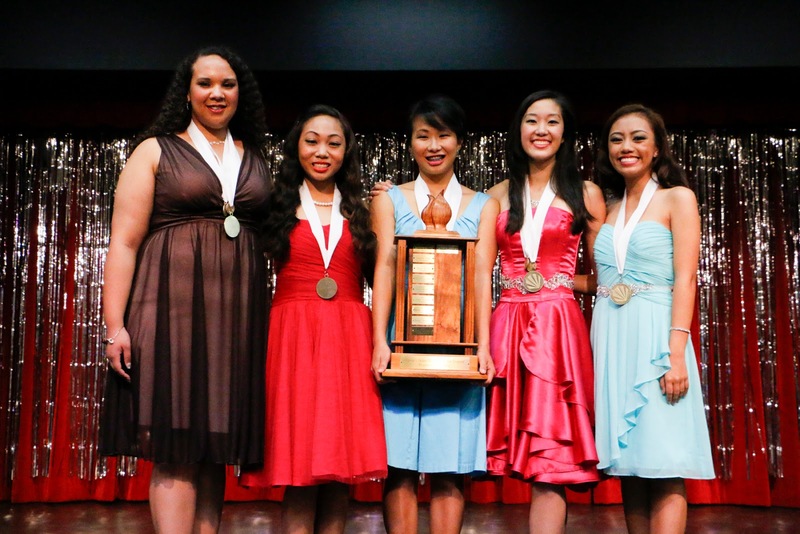 Tianzhen Nie, a senior at Kaiser High School, was named the Distinguished Young Woman (DYW) of Hawaii for 2015. She won a $5,000 cash scholarship, a trip to the Distinguished Young Woman of America National Finals, a 4-year scholarship to Hawaii Pacific University, and many other prizes. Tianzhen took home an additional $2,250 in cash scholarships as the Top Scholar ($1000), and as a winner in the categories of Interview ($750) and Self Expression ($500 each). Kiri Takanishi, also a senior at Kaiser High School, was awarded a $3,500 cash scholarship and a $12,500 tuition scholarship from Hawaii Pacific University as 1st runner-up, and and additional $750 in Talent for her self-choreographed contemporary dance, and $750 as the Scholastics Runner-Up. The 2nd runner-up award went to Regina Kuhia, a senior at Kamehameha Schools Maui, won a $2,250 cash scholarship and a $12,500 tuition scholarship from Hawaii Pacific University, and an additional $1250 for her Be Your Best Self Essay and for Interview. Michelle Pang represented Punahou School and was the 4th runner-up taking home $1000 cash and a $12,500 tuition scholarship from Hawaii Pacific University. Makana Williams, Hawaii’s Distinguished Young Woman for 2014, and Punahou School graduate, is now a freshman at Yale University. Hawaii’s DYW is the state’s oldest scholarship program for high school senior girls, providing students chances to win nearly $18,000 in cash scholarships, 4-year college scholarships, and many other awards provided by local sponsors. The non-profit program, which was previously called Hawaii’s Junior Miss (HJM), is run entirely by volunteers, and competition and scholastic judges are community leaders who represent government, business and community sectors throughout the state. In summer 2010, the HJM program aligned with the national program’s updated name change to America’s Distinguished Young Woman (DYW). The national program is headquartered in Mobile, Alabama, and since its founding in 1958, more than 700,000 young women across the nation have participated in DYW programs at the local, state, and national levels. In addition to cash scholarships, DYW participants are eligible for college-granted scholarships from nearly 200 colleges and universities across the country. Hawaii contestants are recruited from public and private high schools on all islands, and standards for participation are exceptionally high. Only girls with proven scholastic ability and leadership qualities may compete. For more information about DYW Hawaii, please email hawaii@distinguishedyw.org or visit www.distinguishedyw.org.